Lately it's seemed like flashmobs were getting too big for their britches. After all, sending out press releases beforehand kind of defeats the purpose. 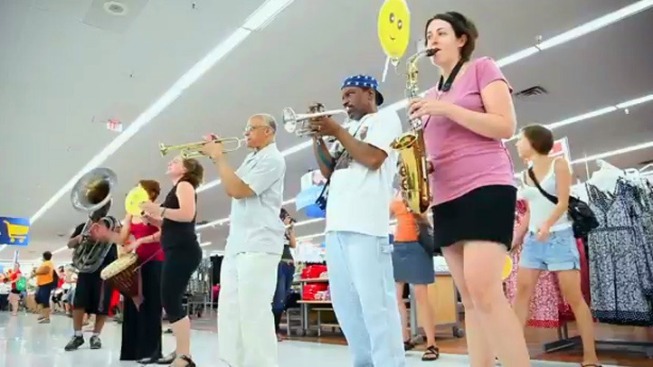 But an activist group called Respect DC recently flashmobbed the Laurel, Md., Walmart with a jazzy performance, and whether you love Walmart or hate it, you've gotta admit this mob nailed the it. The group has a serious message -- it's asking the retailer to show respect to the District neighborhoods in which it's planning to open new stores. But, you know, they did it with song! Which obviously makes everything cooler... at least when the participants have talent (plus a trombone, a sax, a set of bongos and some wicked vocals). They reworked an Aretha Franklin classic: "What you what, Walmart you got it. What you need, you know we got it. All we're asking is for a little respect if you come to D.C.... We ain't gonna give you all our money, unless you give us some retirement, honey." "When I saw the large crowd, heard the band and the words, I couldn't believe it," said Alan Barber, an associate at the Laurel Walmart, according to RespectDC.org. "But then to listen to their words -- that associates should be respected, too -- that really touched me, because we don't get the respect we deserve at work. Management overworks and underpays us, and then makes things worse by creating a climate of fear so most associates are too afraid to demand better treatment." Walmart is expected to open four stores in the District, which will be the first in the city. Proponents of the plan say the expansion will provide jobs and help people get access to low-cost fresh food.